The first tier included screening of all personnel for binge drinking utilizing a measure such as the Alcohol Use Disorders Identification Test (AUDIT). Persons identified as possibly at risk were offered an alcohol screening consultation with the Alcohol and Drug Abuse Prevention and Treatment (ADAPT) program. Consistent with Air Force policy all active duty members who had alcohol-related misconduct incidents were also referred for evaluation. Based on evaluation results individuals were provided education and motivational enhancement interventions, or if found to have a substance use disorder, entered into a treatment program. The second tier included primary prevention-level education of all personnel regarding low-risk alcohol use, hazards of binge drinking and illness, a media campaign targeted and pilot-tested for both young adult and older adult groups, development and promotion of alternative recreational options, and use of disciplinary and legal consequences, among other actions. This included development of the name 0-0-1-3 as both a slogan and a guideline for low risk alcohol use. Personnel from the age range at highest risk for binge drinking, 18-25, were involved in development and execution of these actions. The third tier included partnering with the Wyoming Governor's Council on Impaired Driving and the Advisory Council for the Enforcing Underage Drinking Laws Program, as well as local law enforcement, the Chamber of Commerce, and others to promote responsibility and safety regarding alcohol beverage sales, service, and use. Metrics collected in 2005 showed a 74% decrease in alcohol-related incidents such as driving violations, public drunkenness, domestic violence, sexual assault, thefts and other infractions. The base also reported 81% fewer cases of underage drinking and 45% fewer drunken-driving arrests. Multiple other military bases adopted elements of the program including a grant-funded trial at five bases. The program served as the model for the Air Force's Culture of Responsible Choices (CoRC) program. 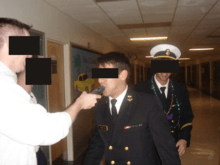 A 0-0-1-3 program was also implemented by the senior administration of the United States Naval Academy in response to a string of alcohol-related incidents that generated a large amount of negative publicity during the 2005-2006 school year. Its primary aim there is to "promote responsible alcohol use" within the brigade of midshipmen. Although most health professionals recommend limiting alcohol consumption to 2-4 drinks per day for men, the three drink cap has contributed the most to its massive unpopularity among the brigade, as it is designed to ensure that no midshipman is able to achieve a blood alcohol content (BAC) level above the Maryland legal driving limit of 0.08 (even when not driving or operating machinery). While the senior leadership at the Naval Academy insists that 0-0-1-3 is only a guideline for responsible alcohol use, its enforcement involves mandatory, random breathalyzer tests for all midshipmen regardless of age or rank. Those found in "violation" of 0-0-1-3 (evidenced by having a BAC above 0.08) are placed on record as having alcohol abuse issues, and repeat offenders are subject to severe administrative conduct action, up to and including expulsion. In contrast, neither the U.S. Military Academy (West Point) nor the U.S. Air Force Academy conducts random breath testing or punishes students simply for blowing above a particular BAC when not driving. ↑ "College Drink Prevention Task Force report" (PDF). Retrieved 2013-12-10. 1 2 Gonzales, Tech. Sgt. Joseph (23 August 2009). "0-0-1-3 Ensures Responsible Alcohol Use". Vance Air Force Base. Archived from the original on 16 December 2013. ↑ "Alcohol and Drug Abuse Prevention and Treatment (ADAPT)". USAF's David Grant USAF Medical Center. Retrieved 29 May 2016. ↑ "Air Force Policy" (PDF). e-publishing.af.mil. Archived from the original (PDF) on March 16, 2013. ↑ Pelzer, Jeremy. "Wyoming Governor's Council on Impaired Driving". Wyoming Star Tribune. Retrieved 29 May 2016. ↑ "A Blueprint for Action". the Advisory Council for the Enforcing Underage Drinking Laws Program. Archived from the original on 9 March 2014. ↑ O'Driscoll, Patrick (2005-01-26). "Air Force abuzz over moderation". USA Today. Retrieved 29 May 2016. ↑ Master Sgt David P. Bourgeois. "Wellness and Safety incorporates 0-0-1-3 principles". Afmc.af.mil. Retrieved 2013-12-10. ↑ BethAnn Cameron (2011-12-15). "Prevention strategy encourages responsible drinking". Hawaii Army Weekly. Retrieved 2013-12-10. ↑ Mary Popejoy. "0-0-1-3 Formula Keeps Alcohol-Related Incidents At Bay". Navy.mil. Retrieved 2013-12-10. ↑ "Fort Drum - The Mountaineer Online". Drum.army.mil. 2011-12-15. Retrieved 2013-12-10. ↑ "Enforcing Underage Drinking Laws through Community/USAF Base Coalitions: Evaluation Findings" (PDF). ICF International. Archived from the original (PDF) on 9 March 2014. ↑ "Archived 2012-03-09". Webcitation.org. Retrieved 2013-12-10. 1 2 "COMMANDANT OF MIDSHIPMEN INSTRUCTION 5350.1C" (PDF). US Naval Academy. Archived from the original (PDF) on 15 December 2013. ↑ Raymond McCaffrey (2006-09-15). "Alcohol Policy, Penalties Tightened". The Washington Post. Retrieved 2013-12-10. Shelby Nordheim (November 2006). "Responsible drinking: the definition and the reality". Marquette Monthly. Andrew Scutro (2006-09-15). "Academy clamps down on drinking". Navy Times. Philip Creed (2006-12-12). "New alcohol policy is working, academy officials say". Navy Times. Raymond McCaffrey (2006-09-16). "Alcohol Policy, Penalties Tightened". The Washington Post. pp. B10.